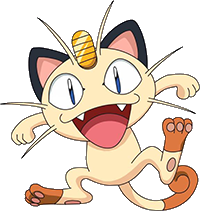 Little Meowth is probably one of the better known Pokes, just because it's pretty much the main "villain" Pokemon. As Team Rocket's #1 mascot, Meowth occasionally shows signs of adorableness, but otherwise, it's still technically a bad guy. And for that, it's not going to get a stamp of approval from me. That being said, Meowth is still okay. I'm sure it's not nearly as stupid as its owners, it's pretty fast (especially when it evolves into Persian), and can learn a nice variety of moves, which is the main reason it's not a bad battler, especially if you're for some reason limiting yourself to unevolved Pokes. One of those moves is Pay Day, which is unique to this evolutionary line. Sadly, though, Pay Day does not give you a candy bar or even that much Pokecash--it's a weak attack that'll net you an extra 50-100 Pokebucks per fight, so...you can buy...half of a Poke Ball? I don't know, but the move is nothing too special, so don't use it!